»In October 2012, Dr Lukas Dorfbauer, a researcher at the University of Salzburg, was examining the manuscripts of the Cologne Cathedral Library. He was looking at an anonymous manuscript and realized that this ancient text contained the earliest Latin commentary on the Gospels. Dorfbauer was not the first scholar to examine the manuscript, but he was the first to realize its significance. Here, as part of the 100-page fourth century AD commentary, was the earliest Latin translation of the Gospels. It’s now available in English. When scholars had looked at this turn-of-the-ninth century manuscript in the past, they had been much more interested in a forged letter “on Pride and Folly” that claimed to be from the Jewish high priest Annas to the famous Roman Stoic philosopher Seneca. To be sure, forged letters between Seneca and Christian religious figures are fascinating (there’s a set of letters between the Apostle Paul and Seneca, as well), but they are of little consequence next to the earliest extant Latin translation of the Bible. The rediscovery of Fortunatianus’s commentary is itself of enormous significance. He was so highly regarded by his successors that a number of ninth-century theologians had looked for his commentary and come up empty-handed. • What makes this particular discovery truly astonishing is that the text of the Gospels that it uses is different from the next-oldest known Latin translation of the Bible. Up until now, the oldest complete Latin version of the Gospels was the Vulgate, a late-fourth-century translation attributed to the priest and theologian Jerome. Jerome, incidentally, was a great admirer of Bishop Fortunatianus, describing his commentary as “a pearl without price”. Pope Damasus I commissioned Jerome to update the “Old Latin” (Vetus Latina) version of the Gospels used by the Roman Church. Jerome went one better, compiling a translation of the entire Bible. The influence of the Vulgate is enormous–over a thousand years later, at the Council of Trent, the Roman Catholic Church would affirm that it was the “authentic” Bible. But now we have more evidence of something older. The English translation of the text was prepared by Dr Hugh Houghton, deputy director of the University of Birmingham’s Institute for Institute for Textual Scholarship and Electronic Editing (ITSEE), and is available online for free from De Gruyter press. • What’s most revealing about the commentary is the manner in which its author interprets his source text. Rather than treating the Gospels as literal history, Fortunatianus viewed these stories as a series of allegories. It’s not that Fortunatianus thinks that the Bible cannot be read literally, it’s just that he is much more interested in its symbolic meaning. While he sometimes uses the verbs “to figure” or “prefigure” to explain his interpretation, he mostly describes the passages as “showing” or “indicating” a particular allegorical truth. What’s especially striking about this new discovery is that Fortunatianus is commenting on the content of the Gospels, the central component of the Christian message. This seems strange to modern readers because so much modern religious Biblical interpretation, especially among conservative Christians, assumes that Bible should be read literally. Houghton notes that literal interpretation did not become de rigueur until the mid-15th century, when the invention of the printing press brought precise uniformity and conformity to the Biblical text. Prior to this point no two manuscripts of the Bible were identical to one another, and literal reading of the text was just one (and not even necessarily the most important) interpretive method. Of course, allegorical readings of the Bible pre-date Fortunatianus. One of the most celebrated ancient interpreters of scripture, the third-century theologian Origen of Alexandria (who is a likely source for Fortunatianus), argued that the Bible could be interpreted literally (what he calls the “letter”) and spiritually (allegorical interpretation). He actually distinguished three kinds of interpretation that he mapped on to the parts of the human body: “the flesh,” “the soul,” and “the spirit.” Origen’s three senses of scripture have been profoundly influential and led him to offer some startlingly modern interpretations. • In other words, Origen doesn’t think that the Genesis stories are literally true. He doesn’t write this as a response to scientific discovery, but he also does not think that the stories are bankrupted as a result. Instead, he thinks, like many others, that these stories are meant to be interpreted allegorically. Allegory isn’t a response to science, it’s an authentic and traditional way of reading and writing texts. History and archeology are today scientific in approach and give us a right and a duty to question and correct the plain errors in ancient screeds like the compilation of them called the bible. The first thing we have to do is to stop using the bible’s own chronology. It is part of its aim of exaggerating its own antiquity, a failing common to the history of most nations, certainly in ancient times. Nothing in the bible is anything other than myth up until the appearance of Omri. Besides Adam and Eve, Abraham, Isaac, Joseph, Moses, Joshua, David and Solomon are all mythical people. 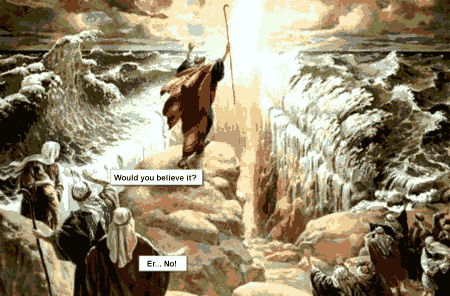 It means Moses could not have written even the Torah (Pentateuch), as is evident from a reading of it. After Omri some known kings are mentioned, so the chroniclers knew about them, but they will have known from the records kept by some major state because small insignificant states were mostly illiterate and had no reason for keeping elaborate records. In fact, the historical evidence for the state called Judah barely exists, at least until a few decades before it was wiped out. It seems likely that Judah was an Assyrian puppet carved out as a rump of Israel around the time the Assyrians annexed Samaria. Only the last few kings of Judah seem authentic, and Josiah, the famous reforming king seems to have been an invention to justify the change of worship in Judah from the familiar Canaanite mythos to a new one introduced by a conqueror. Who then could have made this change and when? Well, if the bible existed in anything like its present form in the fifth century BC, Herodotus could never have been called the father of history, because the bible presents itself as a detailed history right back into the bronze age. The sixth century is when Cyrus took over the neo Babylonian empire which included Judah. The bible itself regards Cyrus as the messiah of the Jews because he “allowed them to return”. In fact no “return” happened before the fifth century in the time of Darius II, when the Persian empire was largely based in Babylon, and it is then when people were deported into Judah with the cover of being themselves former inhabitants of the country, the “Exiles”. Not until this time, around 400 BC, did the bible start to be compiled, and it was not written in its present form until the Egyptian Ptolemies commissioned it in the third century. That is when we first begin to read in historical records that the bible existed. From a posted comment to Jason Rosenhouse’s EvolutionBlog at Science Blogs.